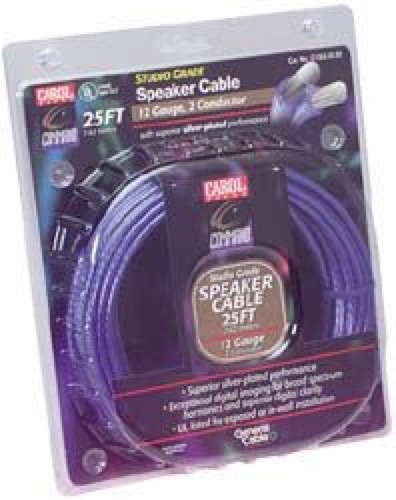 Carol 16 gauge 2 conductor Studio Grade Speaker cable, 25 ft package by Carol Command Series. Superior silver-plated performance. Exceptional digital imaging for broad spectrum harmonics and superior digital clarity. UL listed for exposed or in-wall installation. Carol Studio Grade Speaker Cable was designed for discriminating audio tastes. Carol superior silver-plated performance provides exceptional digital imaging for broad spectrum harmonics and superior signal clarity. For use with audio systems and intercom sound system. Pure silver plating over ETP copper for superior signal rendition. High strand, rope lay conductors for superior quality. Suitable for both exposed and in-wall installation. Convenient footage and polarity makers, at one intervals to make installation easy.